The New New York of the 3000s, the setting of the popular U.S. animated series "Futurama", has developed some new exciting features in the works of Russian Alexei Zakharov. The 3D modeler took some time out to speak to RBTH about his pet project. The Planet Express spaceship that Fry, Leela, Bender and other characters from the popular animated series Futurama travel in bursts onscreen as if arriving from an expensive sci-fi blockbuster. The virtual camera homes in on the finely rendered craft among other vehicles and instantly zooms out to show a breath-taking panorama of the city of the future. The joy is short-lived though - this clip is just 30 seconds long. There is, however, another video with a 3D model of Planet Express and several rendered pictures. Moscow-based 3D modeler Alexei Zakharov was drawn to the idea of recreating his favorite animation series by his love for retro-futurism, he told RBTH. "This is a non-commercial product, I did it in my free time,” Zakharov explains. “The idea was a spontaneous one, nothing big was planned. At first, there was just one building, the Planet Express office, then several neighborhoods around it, then half of the city." He was inspired by the desire to see what the famous animated cartoon that everybody is used to seeing in 2D would look like in 3D, in a style close to reality, he adds. Alexei Zakharov was born in the Moscow Region but has lived in Moscow for many years now. He works as an architectural visualization artist at the Villagio Estate company. 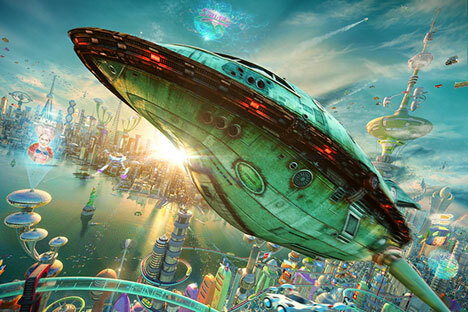 Zakharov started working on his “3D Futurama” quite a long while ago and had to take time off it, sometimes for several months at a time, since he was doing the project in his free time. Altogether, he says, the current renders took about four months of continuous work. Zakharov executed all the sketches and final renders on a computer, using 3DS MAX, Adobe Photoshop, and The Foundry Nuke. For the time being, he does not plan to make a full-length episode of "Futurama 3D": It would require too much input in terms of technology, time and artistic work. "The most that I could do in my current conditions is create a sort of an equivalent of the original opening sequence. But I don't want to be jumping ahead," says Zakharov.